Starting as a young boy from Lancashire with a dream, Joe Clegg has earned his stripes the hard way. From a short time at music college and early touring experiences, Joe struggled with set backs that almost made him give up on his dreams. 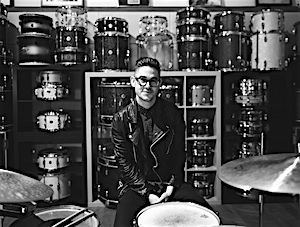 But family support, hard work and sending that one right message got him to where he is today: drummer and MD for chart topper Ellie Goulding. 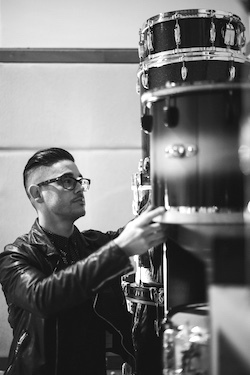 I caught up with Joe at the London Drum Show to chat about his upbringing, his passion for electronics and the challenges of being drummer and MD. When I was twelve years old my parents gave me and my siblings mountain bikes for Christmas. On Boxing Day we all went on a family bike ride but the day after our garage was broken into and all the bikes stolen. My dad sat down with us and asked us if we wanted another bike or if we wanted something different. I went: “Dad, I want a drum kit!”. so he took me to a local music shop and bought me a beautiful sky blue Premier resonator from the 80s. That was the start of my journey. Where did it go from there? Straight into lessons? No. My dad showed me a couple of things. He had something like an early SPDS called a Yamaha DD11. I think eight or nine pads on a black plastic box with an external footswitch that acted as a bass drum pedal. There were a bunch of sounds and play alongs on there, standard things like Shuffle, Blues, Bosa Nova and so on. Headphones on and that was me, I absolutely loved that thing. He could tell I had rhythm and ended up getting me lessons from a really influential guy called Martin Shorrocks. He owned a club in our town and I went to see him for half an hour every week. He had a kit setup in a back room and he taught me how to read drum music by transcribing songs from bands such as Bon Jovi, ACDC and Simply Red. 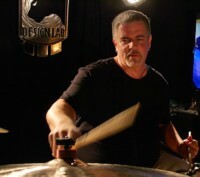 It was a real experience walking through his club every week to play the drums, which I remember vividly. Martin had a massive impact on me and his club was one of the first venues I played at as a musician years later. I didn’t study music at school but was surrounded by musicians through my parents church, so many good people that invested time in me and encouraged me to play. I had a brief stint in a youth orchestra around the age of 13, which was a lot of fun. I sat at the back with a score and two timpani in front of me not knowing what on earth to do! They eventually let me have a go on the kit and let me just play along with the orchestra – short lived but good memories. Then you went to ACM? Yeah. So I didn’t do music at school but I did it at college. I was really into art and english so I wanted to go and do art. My careers adviser at school told me that music wasn’t a profession to pursue, so I decided to do the music A-level course anyway. I had to audition to get on the course because I didn’t have the GCSE in music. I think I played a few Genesis tracks or something like that. College was the making of me really – hours upon hours of practice time at a kit, jamming with fellow students and forming bands, first live gigs and learning from an outstanding drum teacher called Richard Young. So I did my A-levels in music and music tech and went to ACM. It was a big move for me from Lancashire, first time away from home and it was expensive living in Guildford. I worked a part-time job at a department store to help fund my way through the course, with the intention of doing the three year degree. I had an incredible time there but only stayed for a year, completing the higher diploma course. I figured out pretty soon that I didn’t necessarily need a degree in music to do what I wanted to do, fuelled by a hefty amount of youthful ambition to get stuck in to playing. 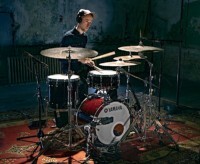 My time at ACM was important and played a key role in my development as a drummer. After ACM you moved back home and started touring with a band called ‘Steve’? Yeah, I moved to Bristol. Steve (the name wasn’t my idea!) had a record called ‘Falling Down’ and were signed on a major deal in America. The album was really good but it didn’t sell as well as it could. The drummer and bass player moved on to do other things and I went to audition. I was actually going to take a year out and work for a charity called NGM, who were doing music projects in and around the Bristol area, but I ended up getting the gig and joined the band. I then spent the next four or five years touring Europe. It was a unique setup where the band had access to a nice splitter van, great gear and crew. Their guitar tech Rusty became a good friend and we’ve worked together on Ellie from the beginning. We played a lot of shows over the years and covered a lot of miles in the back of the van, it was definitely a learning experience. They had a lot of electronics going on in their music – drum loops, arps and keys lines etc – the majority of which had been written before I joined by their drummer Nathan and their bass player Steve who had been in charge of the programming. They had an attention to detail in the sound of their shows that was completely new to me, which meant many hours sat practicing with a click. By the time I left the band we were running playback and video loops via Ableton controlled by midi, having used pretty much every means of playback device along the way. They taught me how to be in a band and the importance of being the best you can be. I loved it. I owe a lot to those guys. I met this guy from Sheffield called Mark Stoney who was around the same time Arctic Monkeys and Bromheads Jacket came out. He had just released an album called ”The Scene and the Unseen” which I absolutely loved. The old bass player from Steve introduced us as he needed a drummer for a last minute showcase. It was a case of no pay but an expenses only trip to LA. It was a no-brainer. The showcase was for mega producer Rick Rubin who was in charge of the label American Recordings as he was interested in signing Mark, but nothing came of it. I remember being at a rehearsal studio in LA called Swinghouse and playing in front of Rick, really hammering out the songs, and being happy with my performance. After we had played I joined the guys outside to hear Rick Rubin complement my drumming directly, which was a huge moment for me. I was in my early twenties, on my first trip to the US and just received a compliment by a legend – I came back from that trip more determined than ever to become a professional musician. I continued to play with Mark off and on over the following year, heading back to the US for my first taste of the South by Southwest festival in Austin, followed by recording an EP with him and the band in Atlanta. It was on a tour of the UK that I met the producer Guy Chambers at Mark’s London show at a club in Soho. I met him briefly after the gig and he was complimentary, which was pretty cool. The following morning Mark came to wake me saying “Your phone is off. Guy’s assistant has been trying to call you all morning”. I got up, grabbed my sticks, got on the tube to Guys studio and he asked me to go in a do some tracks for him that day. It was an amazing opportunity. I ended up doing four tracks at his studio and I honestly don’t think I did that well, it was my first real experience working in a world class studio and I was so nervous. Nervous and hungover. 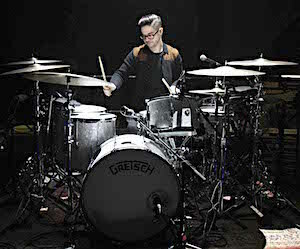 I’m pretty sure that it was Karl Brazil”s kit in there at the time, a black sparkle Gretsch USA Custom. The sound of the kit was insane, via Guy’s EMI pre’s and back through his 16 track 2” Studer tape machine. It was like hearing mastered quality drums directly after the performance. I walked away with some money in my pocket and a train ticket back to Lancashire, with the feeling that this might be a pivotal moment in my career… and nothing happened. I basically ran out of money and knew it was time to move on from living just outside of Bristol. I was teaching, working a part-time job at Starbucks and doing some graphic design on the side. At this point I was married, so my wife and I decided to head back to Lancashire and move in with my in-laws. It was a tough period being back up North, further away from my goals and harder than ever to remain positive that another opportunity would come my way. Sounds like a very supportive family. Absolutely. My wife and I met when we were teenagers, she was an art student and I had only just scraped onto the music course. She was well aware of my ambition and stood by me all the way, which she deserves a medal for. My ambition was to play music, not necessarily as defined as being a session drummer or to be in a successful band, I guess I really didn’t consider what that meant until much later. So there we were. I did graphic design jobs for some friends who gave me money to help me through and kind of gave up on the idea of becoming a professional drummer. I was doing bits and pieces of playing with my good friend Neil Wilson from the Steve days, but that was it really. It was around this time that I played on a record for a producer friend of mine called Julian Kindred, a Canadian that learned his craft in Nashville, who had recently setup a studio in London. I was called in to redo the drums on an album he was working on, and I made a mess of it. I was so worried about doing a great job, about playing in time and making the most of the opportunity, that I sucked. Julian was a trusted friend and he drilled me that week on how to improve my playing, and focus, in a studio environment. I went away from that session feeling like I had so much more to learn before I set foot in another studio, important lessons that have helped shape my playing for the better. It was around this time that I decided to dig into music again for the sheer love of it, rather than with the focus on how to make a career out of it. I spent a good amount of time over the next year listening to new music, keeping tabs on music blogs and discovering new artists. I found a song by Ellie on a blog called Hype Machine which lead me to her MySpace page. It was there that I read a note from her saying that she was looking for musicians to jam with, with no mention of a record deal, so I sent her a message. I didn’t hear anything back for a couple of weeks and I assumed that I had missed the opportunity. Her manager Jamie eventually replied inviting me to meet them in London, and after an audition I got the gig. Within two months we did Jools Holland, I then became the MD and here we are. And what a gig to have! Who would have thought that an eight year journey from a music blog, to MySpace, to email to audition to world arena tour would happen?! She’s a joy to work with and has been since the beginning. She trusts me with her show and I take that responsibility seriously. I didn’t set out to become a music director and had to learn on the job, but I had a solid foundation and wasn’t short of ideas. You’re not just drummer for Ellie Goulding but also the MD – and you pretty much got thrown into the deep end with that, right? When I received the email inviting me down to audition I asked them to send me audio stems, stereo bounces of individual parts that make up the final mix, so that I could listen in more detail. I had a copy of Ableton live on my laptop and began to sample out specific electronic drum sounds from the programmed beats, as well as key vocal parts that seemed to me like obvious things to play live on a sampler or drum pad. I turned up to the audition with an entire backing track setup and Roland SPD-S and played them what I had done. I auditioned myself as the MD without even realising it! At the beginning there was only Ellie, her producer Fin (Starsmith) and me in the band. The three of us maybe did 15 or so shows and it was a really exciting time. After that everything accelerated pretty quickly. Having the producer in the band was amazing because he was able to give me stems, bounce things out for me and let me get on with it. He knew that I was figuring all the music production things out at the same time but still let me do it. When he decided to come off the road he asked me to be musical director. It’s been a massive learning curve and there is always so much more to learn. Being musical director and drummer, having two jobs, is a constant challenge. I genuinely thrive under pressure so it’s not a bad place to be! We played 85 headline arena shows in 2016, with festival season on top of that. It’s been the biggest and most rewarding challenge that I have faced. It’s all the stuff that I dreamt of doing when I was 16 and now finding myself on the back end of it having done it – and now being called to work as a music director for other people – is a really great feeling. You always tell yourself you can achieve your dreams but actually being at a point where you have realised that is exhilarating. That must be an amazing position to be in. Yes, it really is. With Ellie I get to work with a seriously talented band and crew which definitely helps get the end results! It’s an enjoyable challenge to now take what I have learned with Ellie and apply that to other projects as a music director. Walking into a new team with a different management system, a different way of working but same expectation of the final result is actually a lot of fun. I do find it strange though working through the intense pre-production and rehearsal period with an artist to then send off on tour without being in the band too! Which of the two is the scarier position to be in? That’s a good question. Probably standing at front of house. I wouldn’t say that is scary as such, just a feeling of willing a show to go well, for people to remember their parts and for the crowd to engage, without physically being on stage in the thick of it. Touring with a show such as Ellie is my preferred way of working as it enables you to refine elements of the performance, setlist and sound as you go, working alongside the band and engineers. Live music is a wonderful thing. What happens after Ellie or in case you ever get ‘bored’ of it? Receiving a call to be the musical director for other artists is starting to happen more and more. I’ve done a couple of things over the last couple of years in between my work with Ellie. I started working with UK duo Alunageorge at the of Ellie’s second album campaign, which led on to spending six months with Years and Years. I helped put their show together and then passed it on to my friend Max Cooke to take on – Max is a great artist in his own right. 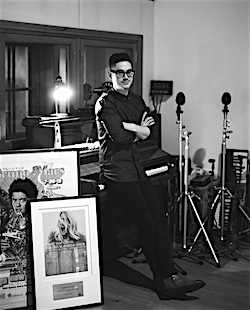 I also worked with a guy called Ben Khan who was left field electronic, so different from Ellie, but he was really exciting and talented. I put his show together without playing too. Around the same time I put together a Live Lounge and acoustic TV performance for DJ Fresh. I started working with Clean Bandit last summer, helping them construct their new live show, which has been a lot of fun – they are so talented and know exactly what they want. I’ve also just done a week with Becky Hill. She’s only 22 and has a staggering voice! I don’t think I’ll ever get bored of working with Ellie as she isn’t boring! She continues to evolve and that creates the opportunity for me to grow – I can’t think of anything that I’d rather be working on really. That said, things never stay the same and I don’t take my current position for granted. I’m looking forward to whatever comes next. You have a wife and kid. How tricky is it to balance tour life and family? Yeah that’s a challenge, there isn’t an easy answer to that. My son is five now and has spent time on tour busses and has done a decent amount of travelling with me, which is something I never imagined would happen. He knows what I do for a living and can understand why I go away for long periods, although that doesn’t get any easier. We have a family vibe on tour with Ellie and I’m not the only one on tour that has a partner and children, so I’m not on my own in that sense. Being based in Lancashire near our family really helps, as you can’t get a better support network than that! Let’s talk about electronics a little bit. Obviously a huge topic but also a big part of your daily life, right? It really is. My vision for the Ellie live show since the beginning has been to play as much of the songs live as possible, using technology as an instrument rather than simply something to play along to. Using a computer to switch drum samples within a song and control realtime fx parameters just feels more exciting to me. When you start to explore the depths of software instruments for recreating synth parts live it gets even cooler – arpeggiators synced and played live, manipulating envelope filters, sidechains and layering multiple sounds enables you to get closer the the record than previously possible. My goal is to recreate the record but to do that directly from the musicians on stage. There is an element of danger that comes with it though, which I think makes the idea of a pop show in an arena environment more exciting. If I don’t play the 32bars of sampled drums in verse one of Love Me Like You Do, you won’t hear the lo-pass filter that opens as I play, as it does on the record. There isn’t a layer of track drums that will take over if I don’t play! If we make mistakes you’re more likely to hear it then if we were just playing on top of track. Will every single person attending an Ellie show hear the difference or relate to my approach? Probably not. They will however know if the show felt good and sounded close enough to the record to make them relate to the performance. Ellie is quieter this year as she works on new material, so I’ll be mostly in rehearsal rooms working on live shows for other people and working away in my own studio up in the Lancashire countryside. 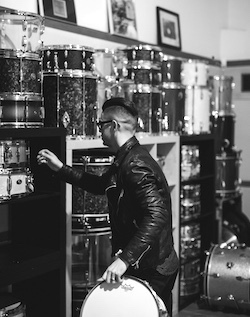 I have a sizeable vintage drum collection (it’s becoming an obsession) that I’m itching to spend some time playing! Thanks a lot for your time Joe!